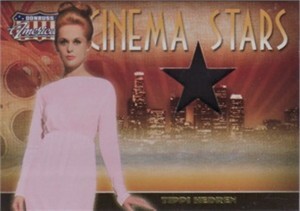 Donruss Americana Cinema Stars insert card CS-24 of actress Tippi Hedren (best known for starring in the Hitchcock movies The Birds and Marnie) with a swatch of dress she actually wore. #229 of only 500 cards produced. ONLY ONE AVAILABLE FOR SALE.